I baked this breakfast cake for my dear friend Lisa as she has been going through a rough patch. I thought baking something for her might bring a smile to her face. I had such a huge success with my Orange Cranberry Breakfast Cake which I adapted from Pam’s Buttermilk Blueberry Breakfast Cake from For the Love of Cooking that I thought I’d make another one. This time, I thought I’d try to keep it as close to the original recipe as possible. I have to say it was delicious –thanks Pam! And I hope Lisa will enjoy it as much as I have. Love you Lisa! I’m always looking for breakfast baked good recipes and I recently discovered breakfast cakes! They look similar to coffee cakes but minus the crumb toppings. If you do a search on breakfast cakes, there are a ton of recipes out there. Sweet, savory or a bit of both —I had no idea! So I decided to make one with oranges since I had so many in my fruit basket. The turbinado sugar topping and the firm texture of this cake tasted just like a scone. And it paired so beautifully with my morning coffee. 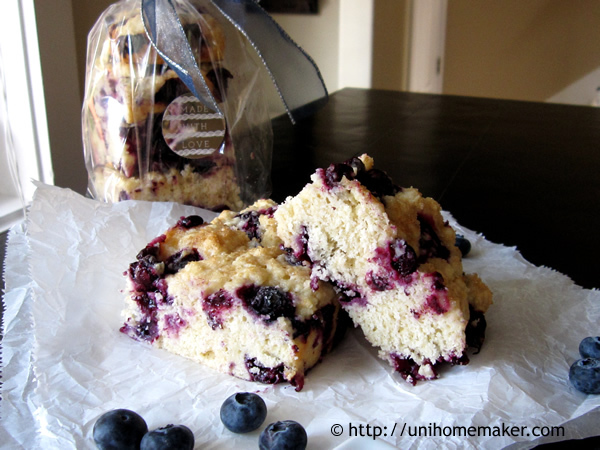 If you enjoy a scone-like baked good, you’ll love this breakfast cake!